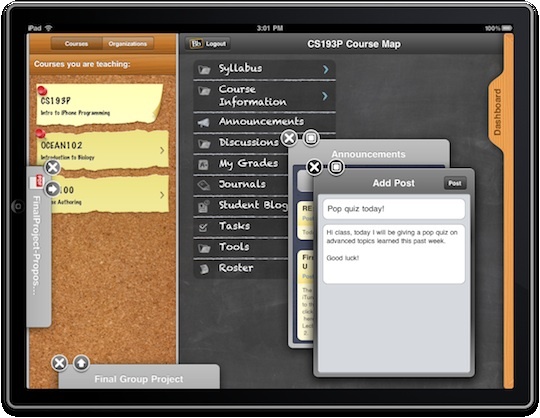 Blackboard has released Mobile Learn for Apple's new iPad. Mobile Learn, which was announced last month, is a new version of the company's flagship learning management system ported for mobile devices, such as Android-based phones, iPhone, iPod, and BlackBerry. Blackboard Mobile Learn on Apple's iPad. Blackboard is making Mobile Learn available free for some WiFi devices, beginning the iPad. According to Blackboard, Mobile Learn will also be available in the United States in June for Android, iPhone, iPod, and BlackBerry through an annual license, although a WiFi-only version will be available at no additional charge. In addition, Blackboard is partnering with Sprint to provide Mobile Learn at no additional cost to institutions for users of some Sprint devices. Mobile Learn for iPad is available at no charge through the App Store. Further information can be found on Blackboard's site here.